For the first time in the country, Megha Engineering and Infrastructure Limited (MEIL), has taken up five water supply projects on an annuity basis. They are Keshavapur Reservoir (Hyderabad), the potable water supply to 190 villages and 5 municipalities of surrounding Outer Ring Road (ORR), 2426 School buildings construction in Nellore and Prakasham districts in Andhra Pradesh and Bulk drinking water project in Bhubaneswar in Odisha. Drinking water supply project to 190 villages surrounding Hyderabad Outer Ring Road (ORR) has been taken up by MEIL at an estimated cost of Rs. 628 crore. This project will be completed within two years. MEIL will be reimbursed the cost by the government in the next 7 seven years. Drinking water supply to Husnabad, Andhol, Jogipet, Huzurnagar, Kodad, Deverakonda municipalities under mission Bhagiradha is the main aim of this project. MEIL has taken this project on an annuity basis with an estimated cost of Rs. 163.85 crore. This project will be completed in 15 months and the cost will be reimbursed in the next 7 years. Under Sarva Shiksha Abhiyan project, Megha is to construct 1378 school buildings in 46 mandals in Nellore district and 1048 school buildings in 56 mandals in Prakasham district. The estimated cost of this project is Rs. 589.72 crore. MEIL will maintain these buildings for five years. 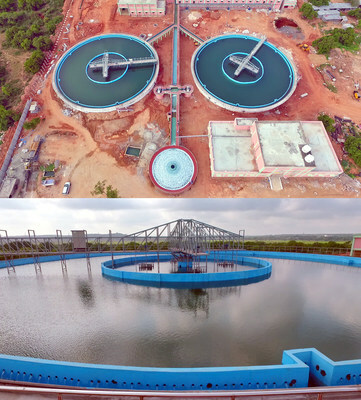 MEIL completed the bulk water supply projects in IIT and NISER and industrial parks in Bhubaneswar and Khorda and Jatna municipalities. MEIL spent about Rs. 187 crore for these projects and will maintain it for 25 years. Megha Engineering and Infrastructures Ltd. (MEIL) established in 1989, is one of the fastest growing infra companies in India. Over the years, MEIL has constructed numerous structures like large civil constructions, oil and gas pipelines, pump houses, large water treatment plants, dams, reservoirs, power transmission lines, power generation units, tunnels – and all of them have an important role to play in improving the quality of life of the common man for many years into the foreseeable future.